If you’re a regular reface.me reader, you know we love the occasional pun. And because of that uncontrollable habit, we couldn’t resist designing the Facebook Like a G6 Button T-Shirt based on the triple platinum hit single Like a G6 by Far East Movement. The Asian-American electro hop quartet based in Los Angeles, California, sold over 3 million copies of their catchy single that also features singer Dev and indie hip hop duo The Cataracs. Even if you hate the song, you just can’t seem to get it out of your mind, partly because you’re often reminded by the passing by muscle car blaring this through its 1000 watt car stereo. And here’s the song’s official video as directed by Matt Alonzo. 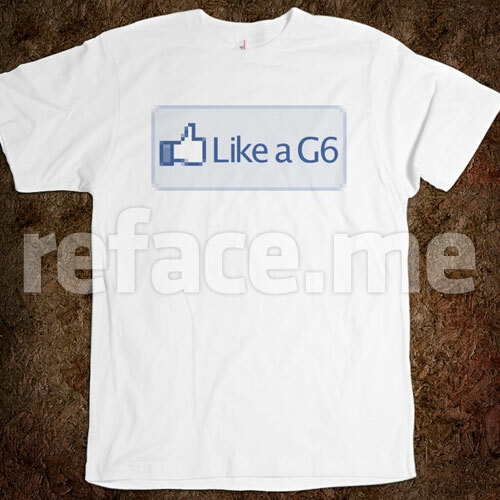 We bet that when you wear this tee, you’ll feel fly like a G6. Posted by Pieter on January 19, 2011 at 2:24 AM. Use this trackback if you're linking this story.